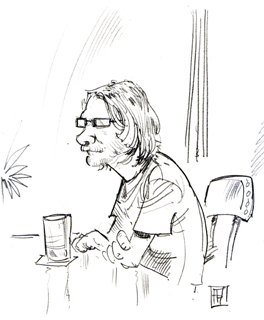 Drawing of Jack Ruttan copyright Patrick Hènaff, 2008. Jack Ruttan is a freelance writer, translator, critic, and illustrator. Born in Calgary in 1958, he has lived in Montreal for thirty years. 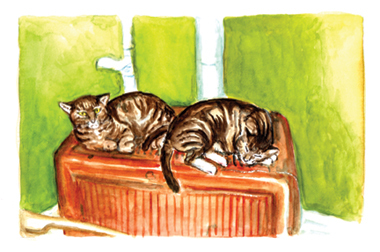 These days, he paints in watercolour, writes scripts for television documentaries (most recently for "What's That About? : The Science of Everyday Life"), pitch documents for new and proposed shows for a variety of clients. He draws cartoon illustrations in digital and traditional media; especially storyboard and concept drawings. In 2004, he went to Thailand to represent the "Ink on the Edge" exhibition of 15 Montreal comic artists in Bangkok. That year, he also worked on the documentary portions of "The Lord of the Rings Concert" with Howard Shore. He was the visual arts columnist for the Montreal Mirror, 1990-1991. Among many other publications, he has written for Canadian Art, La Revue Espace, Matrix, and Books in Canada. Here are some Testimonials from people who have worked with Jack. Canada Writes: Decontamination, by Jack Ruttan; Entry of the Day for "Page Turner Challenge" - beginnings of crime stories, 2012. Here are stories from my Grandmother's journal, about settling in Alberta at the beginning of the last century, and pictures and people from Hardisty, Alberta.